These are simplifications that do both Francis and the Church a great disservice, because they distort who he was by over-emphasizing certain characteristics. 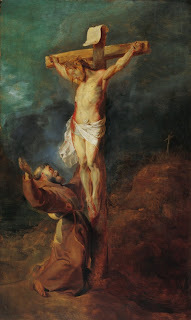 The truth is that we have robbed St. Francis of Assisi of his true identity. 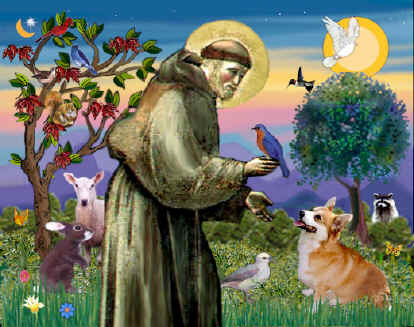 Who was this St. Francis, then? First of all, Francis was a man of great austerity, a fact that we who are living comfortably in the West may overlook. Since his conversion, Francis never slept on a mattress of any kind, but only on the floor; he used a rock as a pillow; he refused to wear shoes and he ate what the poor ate in whichever region he dwelled as often as possible; as for clothing, he had only one patched-up habit. Francis was also an effective reformer. The Church was at a low point during his time: the clergy were uneducated; many monastic orders and bishops lived the high life of luxury; the poor were being exploited by both the Church and the ruling political powers; a good number of clergy, including bishops, had fathered illegitimate children, and so on. In a mystical vision, the Lord called him to “rebuild my Church.” What did he do to rebuild the Lord’s Church? It was simple: “preach the Gospel, and whenever necessary, use words”! It is uncertain whether this “famous quote” of Francis that we are all too quick to pass around actually belongs to him; but even if it were his, it does not do justice to Francis’ great passion for preaching the Word of God – the Bible – to the poor and marginalized. The greatest task that the Franciscan friars had was to bring heavenly food – the Word of God – to the poor along with material assistance. Francis painstakingly laboured over finding methods to present the stories of the Bible to the poor so that they might understand them. This is how the Christmas pageant began! This act of bringing the Word of God to the people had a tremendous impact on the “rebuilding” of the Church: it transformed those who received it with an open heart, and through the transformation of the people, the Church herself was being slowly transformed. Furthermore, his austere lifestyle also played an important part in rebuilding the Church. Many clergy, including bishops, lived scandalously luxurious and often immoral lives. The Friars Minor – the Religious order founded by Francis – were to be the exact opposite. They relied on the alms of the people and all they received went to feeding the friars meagrely, providing them with one habit, and to their apostolic activities with the poor. There was no tolerance for luxury and leisure; there was no frolicking through flower fields for the sake of frolicking through flower fields. Only the Missio Dei, the Mission of God, was of importance: “to preach good news to the poor…to proclaim release to the captives and recovering of sight to the blind, to set at liberty those who are oppressed, to proclaim the acceptable year of the Lord" (Lk 4:18-19). He also emphasized the importance of prayer, a close relationship with the Lord. Indeed, he had such a close relationship with the Lord that the Lord allowed him to experience the marks of His own crucifixion, the stigmata. For years, Francis suffered these wounds with great joy for he was, through these, all the more intimately joined to his Lord. Last but not least, Francis had an unbending approach towards sin and its fruits. He was exceedingly demanding towards himself, his brother friars, and those whom he served. Sin was to be fought against and not to be accepted as the norm, which was all too often the case during his time. After all, the first step towards peace is to confront sin and not turning a blind eye towards it. His austere lifestyle was in part a way of doing penance for the sins of the world. He offered his hardships for the revival of the Church. His preaching always involved a call to conversion and penance, for the two always go hand-in-hand. This is Francis, the saint after which the Pope takes his name. He was not a pushover, flower-power kind of saint. Rather, he was a tough-as-nails fool for Christ who gave up everything for the sake of the Gospel and Christ’s Church. His was a life of drastic simplicity, passionate love, and charitable service. He has much to teach us, and we have much to learn from his example. It is this version of Francis that so many have embraced and followed throughout the centuries, and I believe that it is this version of Francis that Cardinal Bergoglio embraces. What I find striking in his life, above all, is his wholehearted abandonment to his vocation, an abandonment that penetrated not only his thinking, but also every aspect of his life. If we truly believe in the Gospel and the claim that Christ makes on our life, how can we not be another Francis? How can we not burn with such ardent love for the Lord as Francis did after knowing and experiencing His love for us? I, for one, will be the first to admit that I am no Francis but I also have to admit that I cannot deny my intense desire to be like him. Nevertheless, may the Lord give us the grace to desire and strive for it. Don't we do this so often, for many of the saints? Sugar-coat them in our minds...and forget completely about the hard ascetic lifestyles they lived? And this especially when we're trying to imitate them.